Heat oil in a 10-inch skillet over medium heat. Add onions and sauté until tender. Add peppers, then garlic and continue sautéing . Add the cumin and coriander. Crumble tofu into skillet with vegetables. ( Note: if you want more texture in your tofu, simply freeze the tofu, then defrost it, and squeeze out excess liquid.) Sprinkle in turmeric and stir. Add chopped potatoes, tamari and cilantro. 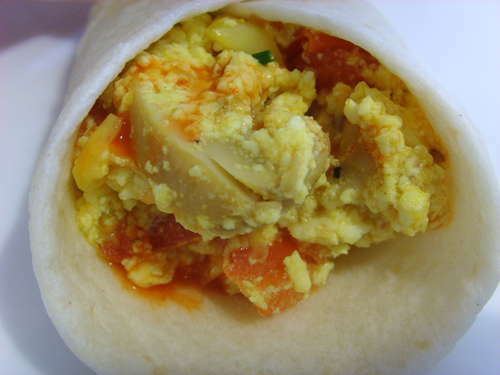 To assemble burritos: Place 1/3 cup of the filling mixture in a tortilla, roll up and top with salsa. Serve warm. Enjoy.